I know, we’re a Bed and Breakfast. What does Corn Chowder have to do with breakfast? Absolutely nothing. But let me explain why you’re seeing this recipe. We made this delicious chowder one cold October night for our dinner and posted a photo on Instagram. It got a large number of likes (who knew there were so many chowder fans out there?!). 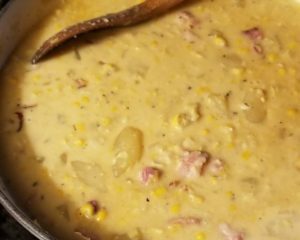 So, by popular demand, we are sharing our corn chowder recipe here. We’re going to give some credit for the creation of this recipe to one of our favorite local restaurants, On the Marsh. Last year, they served a Corn Chowder with a Baked Halibut perched on top and it was amazing. It really was the first time I’d ever eaten corn chowder. Their’s had potatoes and bacon. Now if you’re like me, you really can’t go wrong with anything that has bacon in it! Anyway, I was hooked on corn chowder from that point onward. As the days shorten and the evenings get cooler, I have been thinking about that corn chowder and really craving a big bowl full. I’ve done some tinkering with the ingredients to come up with a recipe we really love. Good quality bacon is important to the final taste. I added the chipotle powder because it gives it a little smokey flavor that tones down the sweetness of the corn. Creaming the corn with the stock helps to cut down on the amount of heavy cream needed to give it a nice creamy consistency. Use low-sodium chicken stock if that’s a concern. It’s an recipe easy to make and will keep well in the fridge. Just make sure to reheat gently (don’t boil). We hope you enjoy it too! Clean the ears of corn. With a sharp knife, cut the kernals from the cob and set aside. You should have about 6 cups of corn when done. Combine 3 cups of the corn kernals and half the stock in a blender. Blend to a coarse puree. Set aside. Dice the bacon. Fry with 2 Tablespoons olive oil in a heavy, large soup pan until browned. Removed from pan and set aside. Fry the chopped onions gently in the remaining oil and bacon fat. When the onions are just going soft, add the garlic and fry gently without burning the garlic. Add the potatoes and remaining corn kernals and fry gently until the potatoes begin to cook a little around the edges. Season with salt and pepper to taste. Add the pureed corn and stock with the remainder of the chicken stock, the bacon, thyme and ground chipotle seasoning. Stir well. Bring to a boil and immediately reduce heat and simmer gently for 20 - 30 minutes until potatoes are cooked through and beginning to break up. Add the cream to the chowder and heat gently until chowder is hot. Do not boil the chowder once you have added the cream. Add more salt and pepper if needed. Ladle chowder into heated bowls and serve.